The advertising industry is booming at a fast pace and there is enough market for everybody to play in. If you offer products, solutions or ancillary services for the advertising industry, Blue Mail Media’s Advertising Industry Email List can give you a strategic advantage. Our list has been meticulously prepared to give you access to all information to execute your multi-channel marketing strategies. Whether you wish to reach out to your B2B customers via telephone, email or mail, our database gives you all the information to meet the purpose. Blue Mail Media enjoys a strong network of data partners across North America, Europe, Africa, Middle East, APAC and South America. This enables us to serve clients with a localized approach. Our team of data scientists, experts and professionals meticulously collect data from reliable sources, verify it, and update the same on a timely basis to maintain high accuracy of our Advertising Agencies Mailing List. We understand that your marketing goals might be different than others, and thus, we offer you pre-packaged as well as customized Advertising Industry Mailing List that align perfectly with your campaign specific objectives. 1. How reliable is your Advertising and Marketing Executives Email List? - Our Advertising Agencies List is highly reliable as it provides 85-90% of accuracy rate and more than 90% of deliverability rate. We verify and update every detail in our list with the utmost care. 2. 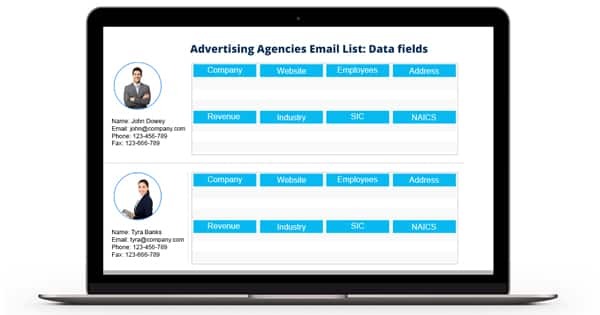 Does your Advertising and Marketing Email Database offer a customization option? - Yes. We provide our Advertising Agencies Email List in both the prepackaged and customized format. You can easily segment the data based on several factors, including SIC code, NAICS code, business type, revenue, geographical location, and more. 3. Can I target the prospects across the globe with your Advertising Agencies Mailing List? - Yes. It’s easy to target the top-level executives and decision makers using our Advertising Agencies Email List. We cover data of prospects residing in various regions such as the US, the UK, North America, Canada, Europe, Australia, Middle East, South Africa, Asia, and more. 4. On what source does your team rely on while compiling the Advertising Industry List? - We have specialized data professionals who collect the data from multiple credible sources. It includes yellow pages, business directories, corporate websites, government records, surveys, events, trade shows, job listings, meetings, conferences, and many more. 5. What are the different data you provide in your Marketing and Advertising Database? - Our Advertising Agencies Mailing List comprises of all the essential marketing information that lets you execute marketing campaigns successfully. It gives you access to your prospect’s first name, last name, company name, job title, revenue, company size, phone number, fax, geographical location, web address, SIC code, NAICS code, and more.